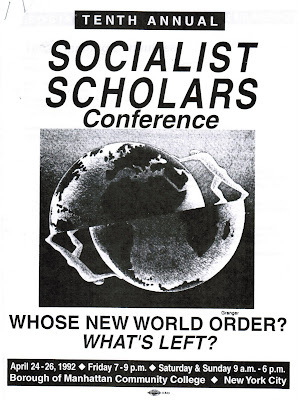 Stanley Kurtz's new book "Radical-in-Chief: Barack Obama and the Untold Story of American Socialism", finally proves that Barack Obama attended the Democratic Socialists of America - run Socialist Scholars Conferences in 1983 and 1984. He also reveals how some of the marxists participating in those conferences would influence Obama's career in later years. 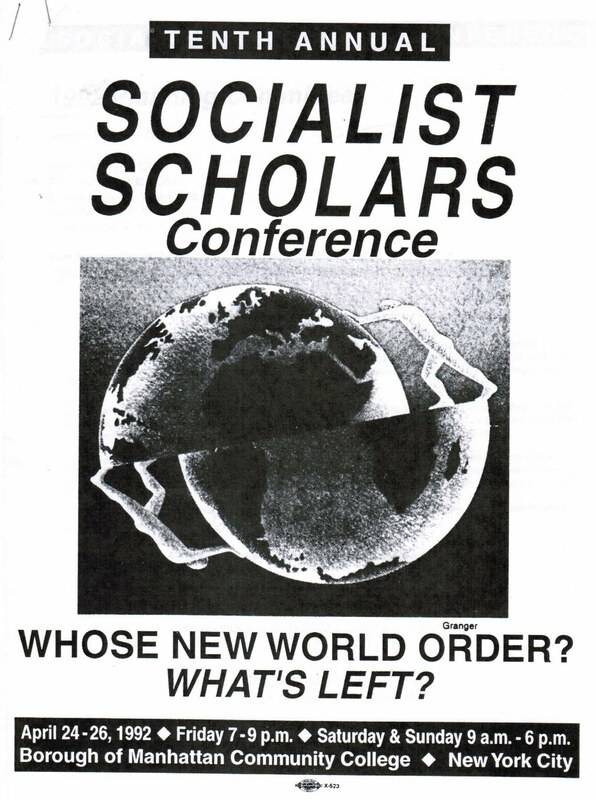 In this post I look at the 10th annual Socialist Scholars Conference held at the Borough of Manhattan Community College in April 1992. One panel in particular was important: "Towards a New Party", with Elaine Bernard, Arthur Lipow, Kurt Stand and Judy Page. The panel was openly sponsored by D.S.A., and Elaine Bernard and Kurt Stand were both leading D.S.A. comrades. Lipow is at the very least a supporter. At this time, the New Party was in its infancy. The first strategic meetings to plan the New Party were held in the Madison Wisconsin home of radical academic Joel Rogers in the very early 1990s. Present at the meeting were Rogers' wife Sarah Siskind, (a lawyer who worked for the same firm as Barack Obama), Dan Cantor (now a leader of the D.S.A. infiltrated New York Working Families Party), ACORN leaders Wade Rathke, Zach Polett, Steve Kest and Jon Kest, Steve Cobble (from the far left Institute for Policy Studies, (there in an advisory role), Sandy Morales Pope (for the first 18 months), and at least at the first meeting Gerry Hudson from D.S.A. and SEIU. Of the conference panelists Judy Page was obviously a New Party activist, while Elaine Bernard went on to become a key builder of the New Party. The most interesting of the panelists however, was Kurt Stand. At the time Stand was member of the D.S.A. Racial Diversity Task Force - charged with finding ways of recruiting (and retaining) more "people of color" into the organization. He would also soon become a member of the D.S.A. 's "steering committee" and later, its "national political committee". In other words he was a key leader of the organization. Kurt Stand was the son of Mille Stand, a long time Communist Party USA member. Inspired by his family's beliefs, Kurt Stand was politically active from his teens - defending Angela Davis and Philip Berrigan and Daniel Berrigan and joining the Young Workers Liberation League; youth-wing of the Communist Party. Kurt Stand was also a long standing spy for East Germany and possibly the Soviet Union. The young Kurt Stand began his spying activities in 1972 after being recruited by East Germany to cultivate other spies in the Washington, DC, area. He was introduced to East German intelligence officers (the Stasi) through his father Mille Stand, a chemical engineer who fled Nazi Germany in the 1930s. An FBI affidavit said East Germany's relationship with the Stand family goes back to Stand's father (Mille Stand), who recruited his son as a communist agent. Stand and his wife, co-conspirator Theresa Squillacote frequently traveled to Mexico, Germany, and Canada during which time Stand would meet with their East German handlers. When the two Germanys united in 1990, Stand’s controllers attempted to recruit him to spy for the Soviet Union and then for the Russian Federation. Although he never gained access to classified material, his role in the operation was to recruit agents and to provide information about the non-governmental groups with which he worked. Stand allegedly received $24,650 for his recruiting and coordinating efforts. On 23 Oct 1998, he and wife Squillacote were convicted of conspiracy to commit espionage, attempted espionage, and illegally obtaining national defense documents. On 22 Jan 1999, a US District Judge sentenced Squillacote to 21 years and 10 months in prison and Stand to a sentence of 17 years and six months. What role if any Kurt Stand played in the New Party is unknown, but the role of its most famous recruit, Barack Obama is becoming increasingly clear. In 1993, the Chicago New Party founded an equally radical "sister organization", Progressive Chicago. New Party members, ACORN activist Madeline Talbott and labor unionist Dan Swinney played a key role in this new organization's formation. Barack Obama was a member of both organizations. 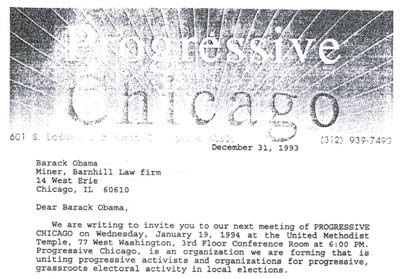 Barack Obama was probably approached to join Progressive Chicago as early July 7, 1993 and was among key members invited to a January 1994 meeting in this December 31 1993 letter. Numerous documentary sources have confirmed that Obama went on to also join the New Party including this clipping from New Party News Spring 1996, page 1. Barack Obama went on to win an Illinois State Senate seat, then a US Senate seat, followed by the Presidency of the United States of America. Kurt Stand languishes in prison, a convicted traitor to his country. However he still remains committed to "changing America". It will be up to those who want genuine social justice to build movements that give him the possibility of pushing further; finding out then whether he will or won’t remembering that the key will not be him but us (us defined as those who worked for his election, for social justice activists, the left) and what we do, how we organize. How we use the social solidarity the campaign is developing as the basis of a renewed social solidarity. Will that be enough—no, the structural roots of the wars in Iraq/Afghanistan, of neo-liberal economics, of the authoritarian aspects of our political culture won’t go gently in the night. Only, however, by working in good faith with attempts to improve what is, is it even possible to imagine the building of the necessary, broad-based, independent, radical formations able to press for deeper changes. Interesting indeed that that Kurt Stand should claim know of Obama's "past activism." Kurt Stand was a Washington DC based labor activist. Barack Obama was an obscure Chicago "community organizer" and local politician. How did he know of Obama's past? What was the connection? Two men once moved in the same circles. One is an now incarcerated traitor, the other is President of the United States of America. Do they still share the same goals? Mr. Kurtz is a top rate scholar and these new revelations are sure to rock our nation. Maybe more folks will open their eyes to the deceptions and the threat it brings to our country's freedom. Thanks for posting the information about Mr. Kurt and his new book Trevor. I have posted a link to this at every blog I go to. This is amazing information and must be spread. I've sent it to Fox News, Michelle Malkin, American Thinker, Canada Free Press and various other sites. Hopefully, you will receive some feedback. I doubt Fox News will pick it up, but Canada Free Press probably will. Thanks for your help. We would probably be completely lost without your research. It is invaluable. There is a Mille Stand that is associated with the Unitarian-Universalist Church of Briarcliff-Croton, in New York. Obama's Grandparents and mother were members of the Universalist Church and Obama attended as a young boy. Coincidence? Mille Stand is mentioned here in their newsletter, but a simple google search brings up lots of references and placements of him here at UUBCO. Obama's name along with Mille Stand is mentioned in this german communist newsletter called RotFuchs dated October 2009. Get this info to Glenn Beck or the new website he started called TheBlaze.com. I am on my Ipad and it's not easy to cut and paste. Glenn has been out having medical tests but will be back in New York tomorrow. I imagine Trevor can get the info to him. Trevor exposed Van Jones and ultimately the info got to Glenn, who took the ball and ran with it. Glenn will get it out there if you can get it to his team, please! Obama a Socialist? Your kidding HUH? Of course he is and he is damaging this country as much as he can.